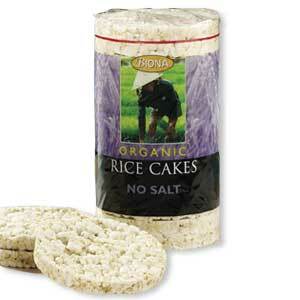 When you hear the words ‘rice cake’, is this what you think of? Quite possibly yes if you frequent health food shops and are on a gluten-free diet. 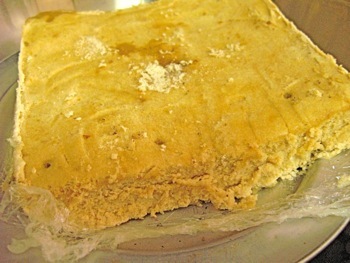 This style of rice cake actually reminds me of the traditional Chinese puffed rice cracker, 米通 mi3 tong1 [Mand.] / mai tong [Cant.]. However, as this Wikipedia entry reflects, many cultures have ‘rice cakes’ and the term encompasses an incredibly diverse range of food items produced from rice. Rice itself comes in thousands of strains, can be in the form of rice grains or rice flour, and can be boiled, steamed, baked, grilled etc. Several weeks ago I tried out a recipe from a Taiwanese book labelled with the English name, ‘Brown Sugar Rice Cake’, and in Chinese, ‘黃鬆糕’(lit: yellow, light cake). I was attracted by the short list of simple ingredients and easy method. 1) Dissolve the brown sugar in the water. Discard any sediment. 2) Put the two kinds of rice flour in a bowl and add in the sugar water. 3) As the mixture will be lumpy, use your hands to break up the lumps. 4) Pass the mixture through a sieve to create the texture of sand. This is the most time consuming step, especially since there is quite a large volume of ingredients. 5) Prepare a tin by oiling the surface, then lining it with a wet cloth. Pour in the mixture and smoothen the top surface. 6) Steam for 10-15 minutes. 7) Leave to cool, then cut and serve. That’s what the book says. My finished cake looked nothing like the photo in the book and it tasted awful! And here’s an awful picture of the cake! You can even see the holes where I poked a chopstick to test if it was done. As with most of my other steamed cakes, this one seemed to take much much longer to be fully cooked than what was stated in the recipe (I must be doing something wrong, OR I simply can’t tell when the steamed cakes are ready :/ !). Admittedly, I didn’t follow the instructions to use line the tin with a wet cloth and just used cling film (as is illustrated in the same recipe book) to make it easier to remove the cake from the pan [17/4/08 update: in the comments to this post, CantonPixie reminded me of the dangerous dioxins released when cling film is heated! oops!]. In the photo you can see I’ve removed it from the pan after it set to continue cooking it in the hope that it would eventually be done! Let me rewind — I actually think the root of the disaster started when I tried to get creative and replace Chinese rice flour – a very fine, light powder that puffs into the air at the slightest movement and leaves a layer of white all over the kitchen and you – with organic brown rice flour, which was heavy and sort of in damp clumps in the case of the type I bought. The cake had a sourish, uncooked taste even after being steamed for more than 45 minutes, and it’s quite likely that was due to the flour (which flour? I’m not sure, but my glutinous rice flour always makes delicious glutinous rice balls!). Finally, we gave up steaming the damned thing, which didn’t look anything like the photo in the book, which showed a dry, crumbly texture resembling coarse sugar grains. In contrast, you can see from my photo that the cut edge looked like dried-out plasticine – yuck. I tried to rescue the dish by chopping the block into bite-sized squares then boiling them as one would do with glutinous rice balls. The taste remained unpalatable and I ran out of ideas how to salvage this disaster. Moral of the story: ‘rice cake’ can mean a lot of things, ‘rice flour’ can mean a lot of things, don’t ‘anyhow’ substitute ingredients (as we would say in Singlish/ Singapore English), and well, you win some you lose some. N.B. : If you want to try the recipe, you might want to also watch this YouTube video for making a very similar kind of Korean rice cake (and yes, it’s 15 mins in the steamer for 1kg of rice flour! I am definitely doing something wrong….). N.B. : for further advice on using different kinds of flours, please see my page on Flours. One of the very earliest things I wrote about on this blog was making Chinese sated eggs at home (as well as a good reason to do so). Eight months and four batches of a dozen eggs later, I’m extremely happy with my eggs but have realised that the eggs do not keep so well once they have been removed from the brine (I use five weeks of soaking in brine). Notice that the yolks have become a strange colour and developed an uneven texture. The whites also taste more salty than before. Overall, the taste is still fine and I enjoy my homemade eggs very much, not to mention feeling reassured that there are no unwanted artificial colours or preservatives and having sense of satisfaction of having made them myself. The solution is to make a smaller batch of salted eggs each time and try to finish them within two weeks. As it takes five weeks to make them, one might start a mini-production line and have a few lots of eggs at different stages of the process. However, that means finding space to lay out the all bowls of brine. They do get a bit sticky on the outside of the container and there may be flakes of crystallised brine so you’ll want a hardy kitchen surface, or else a plastic tray to place beneath the bowls if it’s a surface that needs protecting. Perhaps if one has a set of large stackable containers, you can use those for soaking and stack them vertically to save space, with the eggs that will be ready first put on the top.